We know, Mosaic shows up a lot in this column, but for good reason! 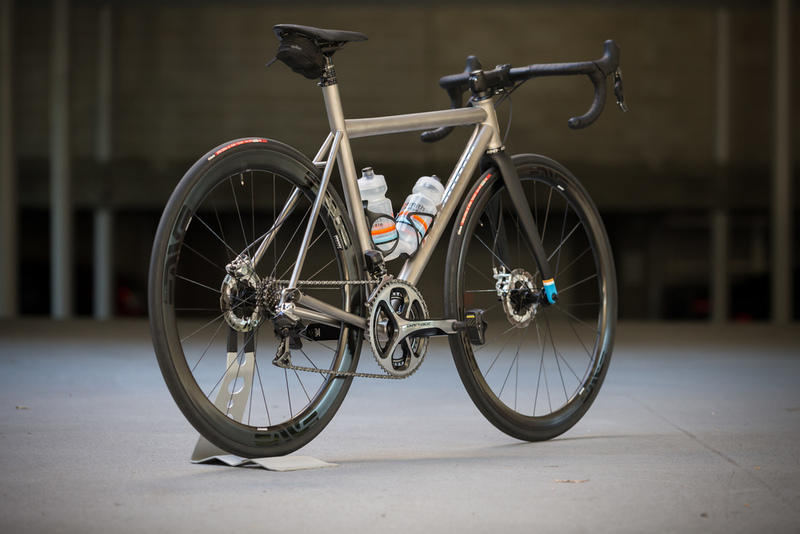 This time we feature a slightly different build of theirs, one that was highlighted at their 2014 NAHBS booth: an RT-1 road bike with disc brakes. Shimano's R785 system is not new to us, having received some of the first kits in the US. It's predictable, reliable, and silent braking are all traits to behold. This particular build features that system matched up with a Dura-Ace drivetrain assembled with care and the beautiful touches out of Velosmith in Wilmette, IL. Velosmith is known for being a fit-first custom shop, but a close second to fit is clearly attention to detail. Every last surface is perfect, yet exceptionally subtle. Velosmith doesn't stop at fancy paint, but cues subtle details like the stripes on the tip of the fork with perfect cable routing and a cockpit that looks like it all came off of the drawing board together. The matte black on the fork, stem, and bars was exceptional and sat perfectly by the Arundel bar tape and cages. Thank you to Velosmith for letting me shoot this bike!